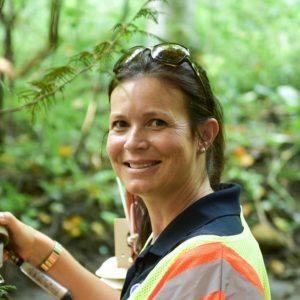 Andreanne Simard manages the spring water sources for Nestlé Waters Canada in Eastern Canada where she is responsible for the sustainable management and development of existing spring sources and leads Nestlé Waters’ long-term monitoring program. She also investigates new spring sources and associated resource valuation and due diligence for the future growth and sustainable development of Nestlé Waters. Andreanne is actively involved in her community, serving as a member of the Rotary Club of Guelph, Puslinch Optimist Club, and the local Friends of Mill Creek organization. She makes herself available to local residents by holding weekly community office hours so residents can drop in and ask questions. Andreanne also identifies opportunities to work in collaboration with local townships, cities, organizations, and universities. Andreanne is originally from Quebec City and holds a Bachelor of Science degree in Geo-Environmental Engineering from the Pennsylvania State University (PSU) as well as Masters and Ph.D. degrees from the Michigan State University (MSU) College of Civil and Environmental Engineering. Previous to Nestlé Waters, she held a senior position in consulting, serving clients in hydrology, water treatment, water resources and remediation. She currently lives in Puslinch, Ontario.